These Fried Gnocchi, Prosciutto and Pecorino Appetizers are simple and elegant, perfect for parties and entertaining! To make the fried gnocchi add the olive oil to a large frying pan under a medium heat. Fry the gnocchi with the rosemary and a little salt until golden and crispy all over (around 10-15 minutes). Finley slice the pecorino cheese and cut each slice of prosciutto into 3. Once the gnocchi are cool enough to touch add one to the end of 20 cocktail sticks. 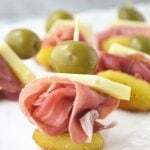 Continue to make a stack by adding a slice of prosciutto and a slice of pecorino cheese followed by an olive. Serve on a serving plate. Recipe makes around 20 appetizers.